Mac: Sometimes, you need instant access to a string of data, but you don’t want to waste space running an app. 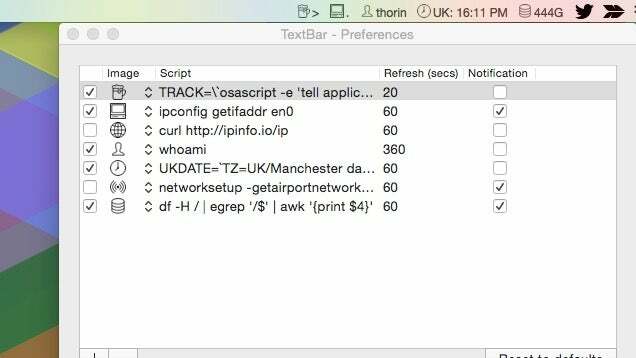 TextBar is a small utility that lets you put any text string into your menubar, including shell commands and other scripts. You can set up TextBar to do just about anything you need, including creating a custom date indicator, showing battery time left, your public IP address, the currently playing song, and more. Conceptually, it’s one of those Mac apps that takes a little messing around with before you find a use for it, but it’s well worth the time. MacStories’ review has a ton of sample scripts and other ideas to get you started.